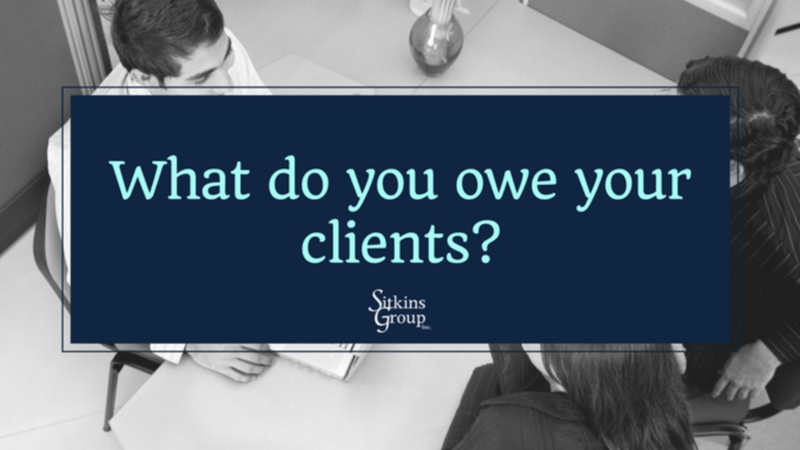 What Does Your Agency Owe Its Clients? Over the years, I’ve asked thousands of independent agency owners and producers the same questions: What do you owe your clients? What value do you bring to them? I’m amazed at how many people have never even considered these questions. Apparently they’ve never sat down as an organization to discuss their obligation to clients or given much thought as to whether they provide them any substantial benefits or advantages (e.g., value). OK, so you represent a ton of companies. Doesn’t everyone? All of the Best People. This statement drives me crazy: “We have the best people in the business.” As if there were some vortex in the universe that magically opened and all the best people in the industry fell into your town and your agency. Sure, you may have outstanding people who are constantly being trained, but “all of the best”? It’s not just about low price. You’ve been low and not won and high and not lost. Who cares if you’ve been in business for 100 years? Why is that important? Basically, none of the above is of great, if any, significance to a client. These are basic things that they expect. Value is not about being the vendor of a commodity where you give someone a low price; it’s about being a trusted advisor. Those who believe that value is subjective may think the better question is, “What does the client want?” Frankly, I’m not so sure that all clients know what they really want because they may not understand risk management and insurance very well. The average client wants to save money, based solely on the escalating influence of insurance advertising. But what the average client needs is protection, at a fair and competitive price. What clients don’t need is a Swiss-cheese policy with a bunch of holes in it! A Great Client Experience. How do clients feel after dealing with your agency? We’ve discussed this before, but I think it bears repeating. Do you offer clients a stay at a roadside motel, or do they enjoy a Ritz-Carlton experience? When a client has finished dealing with your agency on any issue, a great client experience will leave him or her with pleasant memories and a positive impression of your agency. Conversely, a bad experience may leave the client with feelings of disappointment or even anger and contempt. What sort of training is your agency providing to ensure a great client experience? An Annual Review. I firmly believe that agencies have a fiduciary and moral responsibility to complete an annual review on every client. Recently I met with three of my own trusted advisors (my CPA, my financial planner and my attorney). As we talked, I asked the group, “When was the last time you had a formal review of your personal insurance program?” Two of the three answered, “Never,” and the third said it had been five years. What?! These are all substantial income-earners who have full, active lives and a number of expensive toys. Next I asked if any of their current agents had done a personal risk survey when they first started working with them. They had no idea what I was talking about! An Up-front, Formal Risk Survey. As I discovered in talking with my trusted advisors, most people (and small business owners) have never had a formal risk survey completed on their needs, or even heard of one. If you want to differentiate, this is a great starting point. Again, I think you owe it to your clients—all clients. VIP Treatment. In today’s world, if a client is worth keeping, he or she is worth being treated like a VIP. However, there are different standards of VIP service, depending on whether they are A, B or C clients. Our studies continue to show that the bottom 25% of clients in the average agency account for less than 5% of revenue. (If you’re questioning this as you read it, don’t guess that I’m wrong without knowing your real numbers.) So should they be treated as VIPs? If you decide to keep them, yes. While every client is entitled to a great experience, your A clients should receive different service than your B clients, just as B clients should get different service than C clients. Keep in mind that not everyone will want an annual review or a formal risk survey, in which case they can go elsewhere. You want clients who are committed to having a professional relationship with you, not a relationship based on buying and selling a commodity. Full-Time Service. Your clients deserve your commitment to be their full-time agency. In other words, you are the one and only agency they deal with, and they are full-time clients who write all of their business with you. For personal lines, we define full-time as having three or more policies with one agency; it’s two or more policies for commercial lines clients. Having said that, we continue to see that only 10% of personal lines clients are full-time clients and that fewer than half of small/select commercial lines accounts—just 49%—are full-timers. The saying “There’s gold in them thar files” is true. Dedicated Team Members. You owe it to your clients to have designated staff to handle all of their needs. This means that the internal service people assigned to an account truly care about the client and about rounding out the account so that the client becomes full-time. Ease of Doing Business. Today’s consumer does not necessarily want to deal with insurance from 9 to 5. Unless your website provides 24/7 online service, you’re behind the times. Certainly every major automation vendor today has an option for that, but have you actually implemented it? Are you communicating to your clients that it’s available? Great Claims Experience. As we know, most people only “use” their insurance when they make a claim. I get very concerned when I see that some agencies’ claims service is an 800 number to call. I understand the efficiency of passing off a client directly to the insurance carrier, but what’s the follow-up from the agency? Even if the carrier does a beautiful job of handling everything, the agency really needs to be involved in the claims process to make sure the situation is resolved and the client is satisfied. One of the best agencies I’ve ever worked with specialized in workers compensation and took great customer service to a whole new level. Whenever there was a claim, the owner of this agency would personally follow up with the owner of the business that made the claim. He’d actually call the company’s CEO to let him or her know that he was aware of the situation, reassure the client that his agency was on top of things and ask the client to let him know if there were any snags during the claims process. And, by the way, of all the agencies we’ve ever worked with, this one had the highest revenue per employee. Manage Their Total Cost of Risk. Commercial clients need to understand their total cost of risk. You owe it to them to help them identify and quantify this cost, particularly on mid-sized to large commercial accounts. Be An Indispensable Resource. When you think about all the emerging risk issues and changes facing our industry, your clients need someone they can turn to for answers. They need you to be an indispensable resource. 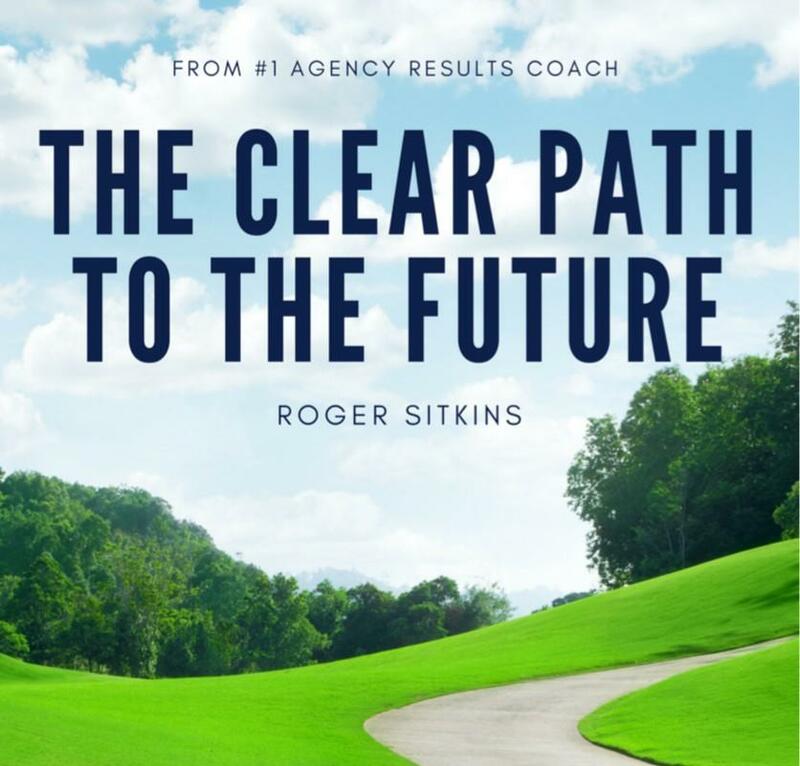 Yet I see that out of approximately 38,000 independent agencies in the U.S., only about 3,000 (fewer than 10%) are doing what it takes to be that indispensable resource for their clients. In closing, my challenge for all of you is to go to every department in your agency and ask each one to answer the following questions: What do we owe our clients? What value do we provide them? If you were a client of our agency, what would you really want? 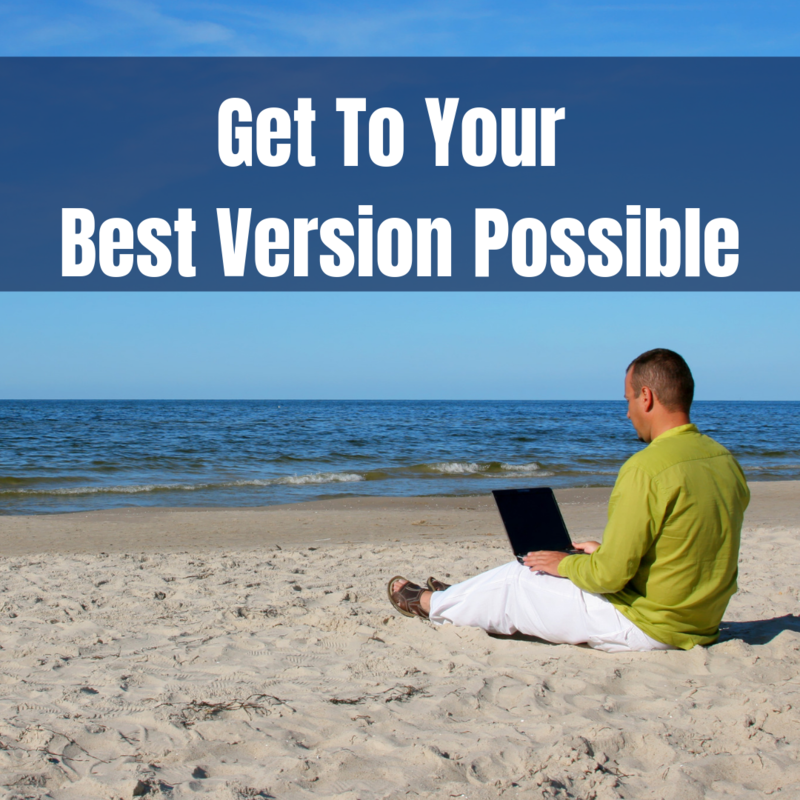 You may recall the marketing term USP: your Unique Selling Proposition. What are the unique and appealing ideas and things that separate you from all other “me too” competitors? Understanding what you owe your clients may help you define your USP. Or, if you’d prefer, you can continue to always do what you’ve always done—it’s your choice. Roger Sitkins is the CEO of The Sitkins Group. 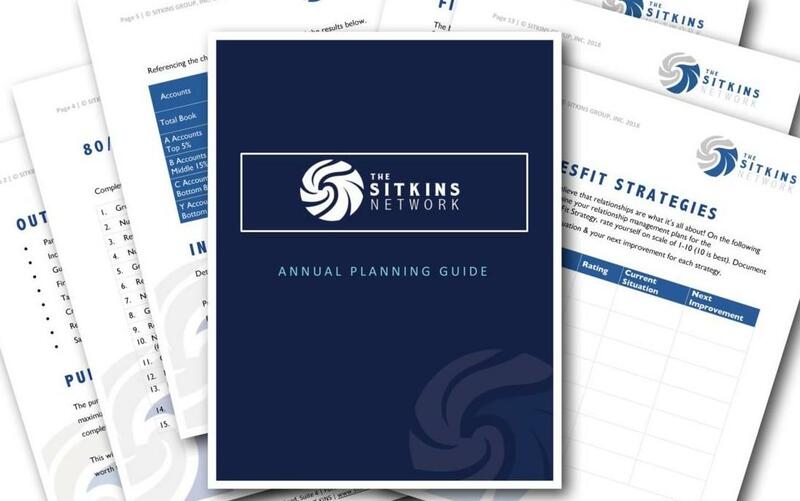 To discover how we help agencies Sell More, Retain More and Earn More, visit www.sitkins.com.